Available today, the new Rock Drum Machine implements fresh features like Live Pads and Ableton Sync, making it an unique and valuable tool for any rock musician. 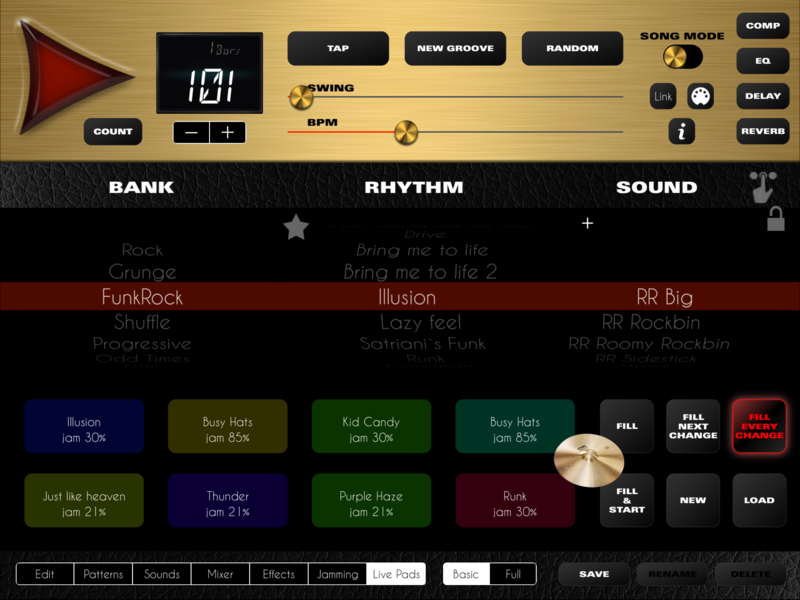 RDM Turns the iPhone or iPad into a solid Rock Drummer with powerful drum sounds and tons of rhythms to get energetic drum grooves easily in a flash. Now, the new Live Pads with Midi Controls allow to play live sessions on the way assigning rhythms and jam intensity to any of the 8 pads and fills buttons. 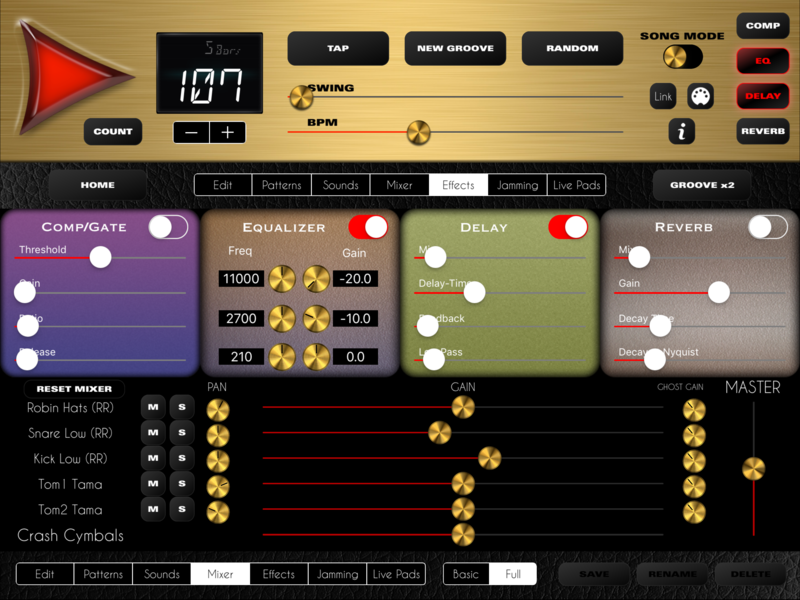 Combining it with Ableton Link sync multiplies the chances to expand the creativity. 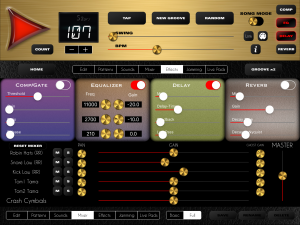 The jam tool is a very special feature designed to make drum variation on the way without the need to stain our hands programming, just moving a slider to set the intensity. It has been improved in this edition and now is posible to tell the drummer what components to improvise and what to keep stable. 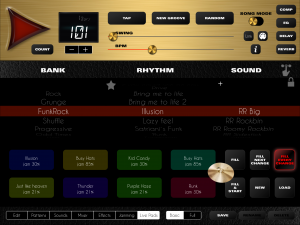 Rock Drum Machine 4 is now available in the App Store for 14,99$ and requires iOS 8 or newer version. This entry was posted in Ableton Link, Rock Drum Machine, Updates on October 24, 2016 by LumBeat. Hi, I am a professional live musician looking to use your apps for live solo performances with guitar or piano. I will be changing all my keyboards and outboard equipment into an ios based set-up. Ideally I would like to use several of your products in one app…is this going to be on offer at some stage? Also it would be really useful to have midi control (via footpedals in my case) over start/stop, tap tempo, fill, jam intensity and overall volume. Is this already a possibility in your apps or is it coming soon? I would be happy to pay much more for a product with these features, it would replace hardware that cost in excess of 300 euros.